This is a clean fresh salad that highlights the best of summer! This salad will serve six or more. This salad pairs perfectly with salmon burgers off the grill and a side dish of roasted peppers or baby potatoes done in basil oil. 1. In a food processor combine first five ingredients puree gradually adding Basil Oil. 3. 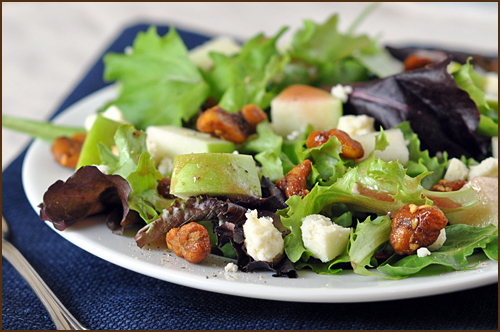 Drizzle in dressing, toss in nuts and serve. 4. Expect everyone to ask for seconds!